RUTLAND—Fall sports are officially underway at College of St. Joseph, with four teams playing throughout the last week. CSJ went a combined 0-7, with each team still looking for their first win of the year. Men’s soccer was 0-2, losing to a pair of tough opponents in Southern Vermont College and Dean College. Women’s soccer also went 0-2 on the week, struggling to find their groove as a first-year program. The newly-formed CSJ golf team hosted their first event at Green Mountain National Golf Course in Killington on Saturday, Sept. 3 and ended up losing to NHTI in a reasonably close match. The women’s volleyball team closed out the week, going 0-2 against Johnson State College and Paul Smiths College. Women’s soccer started off the week going up against a strong Southern Maine Community College team. It was a long day for the Lady Saints, who ended up losing the game 13-0. Southern Maine CC outshot CSJ 41 to 1 and were in control throughout the entire game. Lady Saints goalkeeper Florence Tavares had 12 saves on the day. Men’s soccer traveled to Southern Vermont College on Thursday to take on the Mountaineers and were in for a battle. CSJ fought hard from start to finish, but failed to take advantage of several opportunities, eventually losing 2-1. Amani Francois was credited with the lone goal for the Saints in the 67th minute of play. The CSJ golf team faced off against NHTI on Saturday and played well, considering it was their first taste of competition as a new program. CSJ had a total score of 451, but NHTI had the edge, finishing with a final score of 424. Alec Babyak had the best score for the Saints with a round of 102. Women’s volleyball played matches against Johnson State and Paul Smiths, losing in straight sets to both teams. The Lady Saints had their chances in a few different sets but were unable to get points when they needed them. Jenna Crowley led the team with 15 kills on the day. Men’s and women’s soccer each played on Saturday as well. The men faced a well-oiled machine in Dean College. They played tough, but Dean College was simply too much for the Saints to handle, eventually losing 3-0. Women’s soccer played against Lyndon State and was defeated 13-0. It was another one-sided affair for the Lady Saints, who found themselves on the wrong side of a blowout. Florence Tavares had 17 saves, but Lyndon State was able to get a staggering 56 shots off. 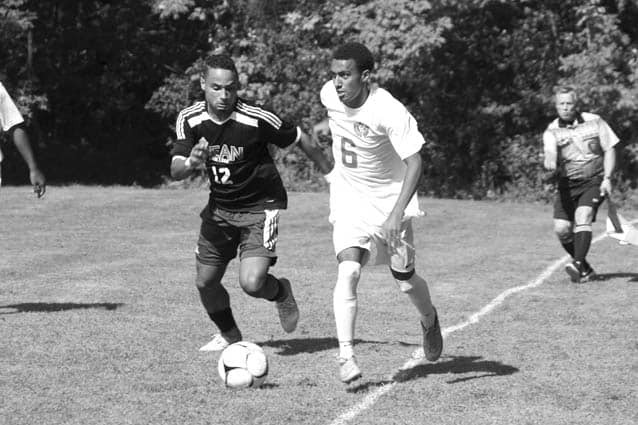 CSJ’s Alex Andrade works for control of the soccer ball during this past weekend’s match against Dean College.